by PaulEMoz in "Dungeons and Dragons", "GOG.com", "Planescape Torment", "RPG", "undead"
Here's a game I've meant to play for years. I'd originally bought it when I was living in America. At that time, there were companies that were re-releasing classic PC games in cool cardboard slipcase/jewel case packages, costing no more than $9.99. Every time we went to any mall or outlet, I'd pop into the games stores and see what new stuff they had on the racks. I managed to build up a fairly substantial and, dare I say it, impressive collection... only to lose a fair bit of it when I sold a lot of stuff before I moved back here. It's proven more difficult to find over here, but recently it's had a physical re-release and has been made available on the fantastic GOG.com. And that's where I got it from. Well, that's just lovely, that is. Planescape: Torment is a computer RPG based on Dungeons & Dragons rules. That means nothing to me, as I only briefly dabbled in D&D and that was when I was about nine years old, when an older lad who fancied himself as a Dungeon Master both created and killed my character within the space of about two hours. Wanker. Anyway, enough of my mental scarring. When I first played this I got stuck in the first room and didn't have the patience to carry on... that, plus I had too many other games to play (that bit hasn't changed at all!). This time, I vowed to do better and see exactly why this game is so highly rated in the gaming community. Damn the limitations of a 400px wide image. It turns out that the reason the game is so highly rated because of the dialogue. Planescape: Torment is very dialogue-heavy. 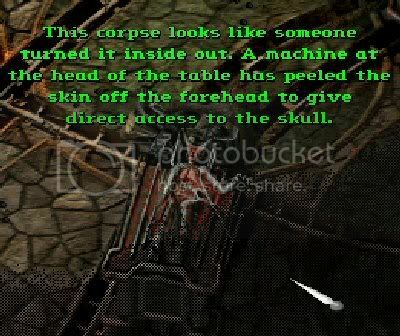 In many games this can be tedious, but Planescape: Torment has some very funny and quirky dialogue which is almost always a joy to click through. You're an undead character, waking up on a morgue table and not actually realising your plight. And you'd probably never realise your plight, if it wasn't for the incredibly mouthy skull that befriends you and proceeds to rabbit on the whole way around. Morte is your new friend's name, and he's the sassiest, sarkiest skull this side of Trap Door, but with a healthier sexual appetite. Yes, you read that right. Those cadaverous laydeez that wander around the place are right up his street, and he doesn't mind letting you know it. It's a bit bizarre, and pretty funny. Phwooooarrr, eh? Look at that bit of stuff. Dialogue aside, I have struggled a bit with the actual game so far. It's an isometric 3D adventure... it's not exactly Knight Lore, it's a bit more advanced than that, and it employs a "fog of war" technique which keeps large areas of the playfield obscured until you actually need to see it. That hasn't been the issue for me, it's that the game has a lot of menus and I still haven't quite got to grips with all the options and icons. Still, that's my own cack-handedness to blame. It's not the game's fault that I have a hard time actually clicking on the thing I want to kill. Combat hasn't been particularly exciting so far either... it's pretty much a slugfest at the moment. It's obvious that there's far more depth to Planescape: Torment than has been revealed to me so far, and the banter alone is easily enough to keep me going, with the interesting storyline adding an extra hook. I reckon I'll be getting a netbook soon, and I can easily see me installing this on there and playing through it at a leisurely pace.